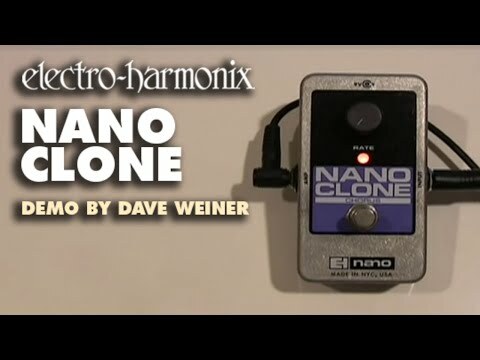 The Electro Harmonix Nano Clone guitar effects pedal delivers shimmering Chorus in a delightfully compact design. This little beauty delivers the sweet analog powered tones of its sibling, the Small Clone, but in an even smaller package. Weighing in at a mere 0.3kg, measuring just 71 x 86 x 147 mm, you have no excuses for not fitting the Nano Clone into your daisy chain. The pedal can be powered using the included 9-volt battery, or an optional power supply can be inserted into the power jack. As you'd expect from the team at EHX, the unit may be small enough to slot into any pedal arrangement with ease, but it is anything but delicate with a chassis that appears to be able to withstand the most energetic of assaults - making it absolutely perfect for touring musicians who demand resilience from their gear. Control could not be easier. Simply place the Nano Clone into your desired place in your signal chain, turn the Rate knob to adjust the amount of effect you wish to inject into your tone, and play to your heart's content. Whether you're looking for subtle shimmer to accentuate your clean tone, or wish to create a huge swell to give your lead tones greater depth, then all you need to do is turn the knob accordingly. Not only does this make it easier to find your level, but it makes adjustments incredibly easy on stage - the last thing you want to be doing is fiddling around in the dark in front of an audience. If you're looking for an exceptionally easy to control Chorus pedal, which can produce lush, textured tones that lift the character of your tone to perfection, then the Electro Harmonix Nano Clone is perfect.